PDE partners with exceptional architects, electrical engineers, mechanical engineers, software engineers, and subcontractors to provide complete energy savings systems integration into our valued customer’s facilities. In concert with our superior partners, PDE develops and designs proprietary software systems that maximize energy efficiency throughout our client’s facilities. PDE initiates and directs extensive pre-planning and execution necessary to keep all electrical and mechanical systems operational while upgrades to operational facilities are in process. PDE’s projects are game-changers and influencing how facilities use, produce, store and monitor energy. Using the NZP ETI as a living laboratory, PDE Total Energy Solutions worked collaboratively with the building industry to develop a road-map for how it can apply Net Zero Plus strategies to its projects. Using Net Zero Plus strategies, building owners can achieve an early market advantage with their real estate assets. High performance and net zero energy buildings, both new and retrofitted, yield strong returns on investment for owners through reduced operating costs, improved tenant satisfaction, and new streams of revenue. PDE Total Energy Solutions installed and built the infrastructure for 100 Level 2 EV chargers and 4 DC fast EV chargers for LAPD's new fleet of electric vehicles. This represents the largest electric vehicle fleet and charging installation to ever serve a police department and underscores the both the City's and PDE's dedication to improving Los Angeles' air quality by adopting innovative transportation solutions to reduce greenhouse gas emissions. PDE Total Energy Solutions provided the utility infrastructure to support the world’s most powerful rooftop solar project. The project is one of the largest solar Feed-in Tariff project in the nation this year, a 2 million-square-foot 16.5 MW rooftop solar array. PDE’s scope to provide critical infrastructure, including installation of vaults, underground conduit, project management and coordination with LADWP. The panels have a bifacial design, allowing them to gather about 45% more power than a traditional solar panel. PDE completed the project in June 2017 with Zero Punch list Items and Zero Safety Issues. PDE provided engineering/design/equipment and construction management for an energy storage system to support a 1MW solar installation and reverse osmosis plant. This is the largest installation of its kind in the region and is a game changer for energy policy and delivery in the region. The installation is located on the Island of Anguilla at the Cuisinart Resort. The system went live in August 2014, the resort now operates its reverse osmosis plant, producing over 300,000 gallons of fresh water daily, utilizing 100% renewable energy. PDE is the prime contractor, responsible for complete design, procurement, construction, and commissioning for this 1 MW, 480kWh energy storage system, grid-tied, firming a 1.2MW solar array. This demonstration project will assess the energy security, energy efficiency and reliability benefits realized from the integration of a 240kW, 480kWh, Battery Energy Storage System (BESS) with a 1 MVA inverter. The project will also demonstrate how a robust BESS will alleviate renewable energy intermittency, improve island-mode operations, and reduce demand charges and peak load stress on the main transformers and other grid equipment. The project is scheduled for completion Q1-2015. The project was awarded through the Department of Defense Environmental Security Technology Certification Program (ESTCP) and was recognized as number six in Forbes.com as one of the Top 12 Energy Projects to Watch in 2012. PDE provided design, engineering, electrical and general construction for NAVFAC to build the infrastructure for testing and validating of microgrid components including: inverters, batteries, PV panels, controls systems. The project features new 4000 amp switchgear, and AC distribution system; 57kW-DC photovoltaic; batteries; 1MVA resistive/reactive load bank; underground duct bank construction; advanced lighting controls; advanced microgrid controller and building load integration; relay protection design and logic. PDE provided design-assist, construction and commissioning of a 60kW battery energy storage system for the microgrid at the campus. La Kretz Innovation Campus acts as a cleantech hub for the City of Los Angeles. The space will showcase off of the latest green technologies to inspire adoption of new technologies. The fully renovated building located at 5th and Hewitt Streets in the dynamic Arts District of Downtown Los Angeles comprises 3.2 acres and is owned by the Los Angeles Department of Water and Power. 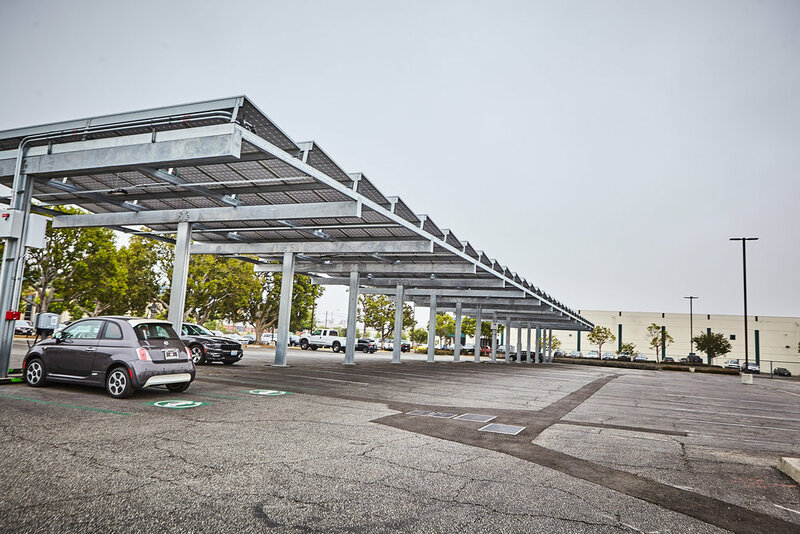 PDE provided Engineering, Procurement and Construction services for a 125kW Photovoltaic, 100kW / 400 kWh mobile microgrid project at Port Hueneme, Ventura Naval Base. Design Build of a grid-tied interactive energy storage system. PDE designed the structural and electrical for this project and performed all general construction. The project received ETL field approval and building and safety permits. SCADA system was designed for remote operation and monitoring. Project demonstrated firming of a renewable energy source and peak-shaving applications.